Like many knitters, I love to knit for others -- sometimes even more than I do for myself. There's nothing like giving a gift of time, tailored to the life of someone you love.Knitting for someone else is an extraordinary process -- I feel as if my emotions for the recipient somehow flow into the stitches themselves. I think about them with every row. I think back on the memories we have together, why I love them; I think of the future memories we will make. I think of the new adventures that this garment will see, by their side or on their skin. I imagine this item -- new to them and so familiar to me -- giving them warmth, comfort, and love. I like to think I infuse a special kind of love in the finished knitted product. Sometimes, though, as the item takes shape, it gives feelings back to me instead. The project begins to take on the personality of the recipient, and our relationship, leaving me, when it's done, with the same feelings towards the object that I have towards the people themselves. 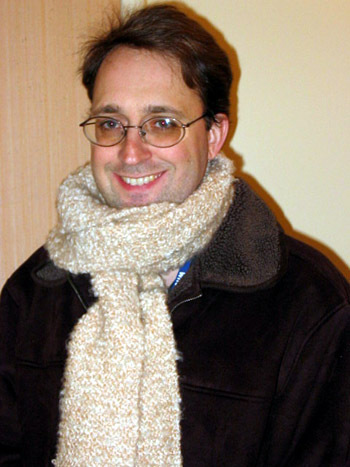 For example, about a year ago I knit a scarf for someone I know. This person always seems to envy others, never seeing her own great worth in this world. And wouldn't you know, the scarf brought out the emotion in me. I wanted it for myself. 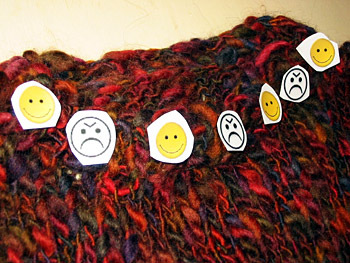 I wanted to make the same exact scarf for myself, as I was making this one for her. I envied it, even as I loved it as the perfect gift for my friend. But of course in the end I gave it to her, and she loved it. I felt generous, the way this friend has always been to me. I've never made another for myself, and as time goes by I realize it wouldn't be right for me, anyway. I matured into my knitting, as she has matured into her life. Recently I made a small blanket for a friend of a friend. This person is difficult, hard to get along with at times, and complicated -- but when you get to know her, she's warm and loving, and ever-generous. Again, the blanket took on her attributes. I was using double-strands of yarn and it tangled at every turn, no matter what method I used to unravel it. The pattern was repetitive, unforgiving; the work was tedious. As with my new friend, I took a deep breath and held on, believing the end result would be worth it. And again mirroring life, the finished product was surprisingly soft, astoundingly lovable. Years ago, I began a project with a complicated intarsia pattern for a boyfriend, in hopes that it would be a perfect gift -- full of my time and my devotion. But just like our rocky relationship, the pattern would not budge, and did not get easier, even as I accustomed myself to its ebbs and flows. I knew I had bitten off more than I could chew. I tried everything. I put it down for a while, I picked it up in quiet moments, I changed techniques, I stayed determined. It was bittersweet to realize that I was doing the same thing in life, with him. The relationship was going nowhere, and neither was my scarf. I wound up binding it off, and we did not stay together. There was nothing more that I could give. There was no energy left, for what was ahead, and I had to admit my -- and our -- limits. They're not all this hard: one friend who just had a baby received a blanket that, like my relationship with her, was easy, intimate, and without any hitches. Another friend, whom I admire for her convictions and complexity, received a baby blanket full of her own essence, a complicated pattern that was at the same time fun to explore, full of nuances and uncharted depths. I have a great relationship with my mother, and everything I've knit for her has also been easy, flowing, literally "close-knit." The shawl my grandmother wears -- my way to keep her warm now that I live far away -- is full of my mistakes that she does not see. She does not see those mistakes, she says, because the shawl does what it was made to do -- protect her from the cold, and remind her of my love and closeness. My husband's scarf, made in a difficult boucle yarn that was new to me, is filled with "rookie" mistakes, frayed yarn that was pulled out and re-knit, fringe hanging on by literally one thread. But he wears it anyway, and proudly. He never goes out in winter without it. He understands that a relationship, too, is full of these things. He knows that the key is to view these things with appreciation for the sum of their parts. Now, we are thinking of having children soon. 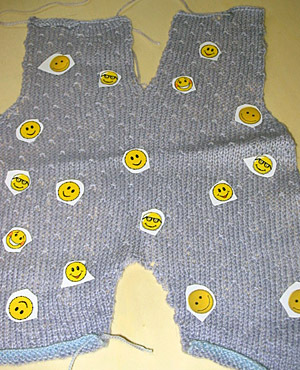 What will my knitted projects for them be like? What will I weave into them, and what will they weave into me? If they go as they have been, the projects will represent motherhood in all its joys and pains. A lot of wincing at my own mis-steps, a lot of wondering why the yarn isn't behaving as I'd like, a lot of deep breaths while pushing through the tough parts. A lot of softness, a lot of challenges overcome. A lot of patience, weaved into every stitch. And most of all: a lot, a lot, of hope. I'm looking forward to this new journey, in this fabric and in my life. 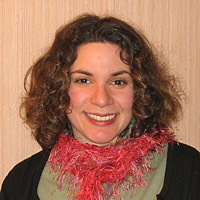 Michelle Cristiani is an anthropologist living in Lyon, France, with her husband and two cats. She is fascinated with the power of colors, and has always loved yarn because it allows for feeling a color as well as seeing it. © 2004 Michelle Cristiani. Contact Michelle.